In my first attempt many years ago, I used garlic spread and regular white bread (sliced into triangles). This time I used garlic bread and regular cheese spread. Similarly, I used green pepper and green chilli as well last time, this time I used red and yellow pepper without green chilli. So the options are limitless and open to adaption as per your taste. Another dish from V’s bday menu. Blog hopping schedule gives an advantage of planning as & when you require. I looked for recipe on Kalyani’s blog for a dish to accompany spinach pasta, pizza (base from outside) & what better than something similar to Garlic Bread. Kalyani has very aptly named her blog as Sizzling Tastebuds & really all recipes sizzle on her blog. Extensive collection of world cuisine. I was waiting for a chance to create a recipe from her space so finally the Wednesday has come to share the same. I used garlic cheese spread instead of grated cheese, rest I kept same. 1. In a small bowl, mix together red and yellow peppers, seasoning, chilli flakes, salt and pepper. Add cheese spread to the mixture and gently fold in using a spoon. 2. Lightly grease the slices with ghee. Spread a spoonful or more of cheesy mixture on each slice. Sprinkle grated cheese on top. 3. Pre-heat oven to 200 C. Very lightly grease the baking sheet. Then grill toast for 2-4 mins till cheese melts. Serve hot. So the options are limitless and open to adaptation as per your taste. 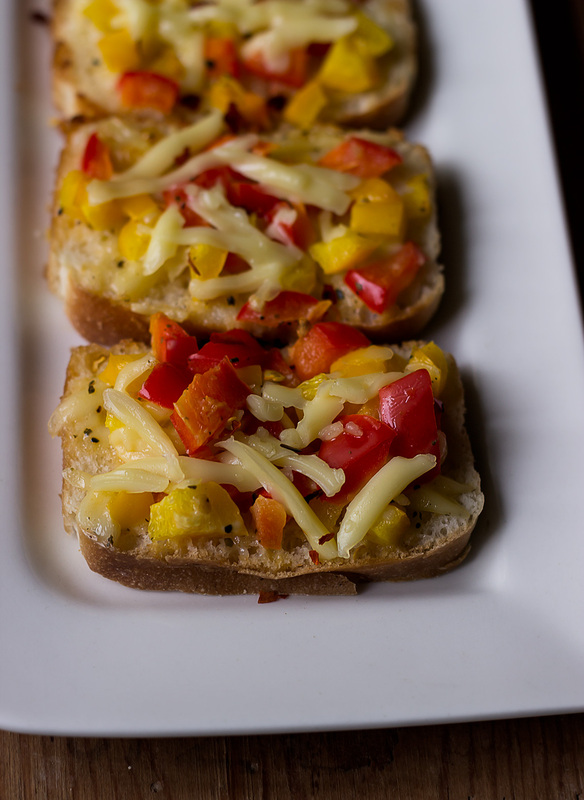 I had some leftover spread left which was happily confiscated by the guests as they wanted to make these Garlic Chilli Cheese Toast at their place. It was a very simple & quick recipe. I loved it.